Shopping for Star Wars Action Figures? The legends that started it all! Collect all 12! Original Kenner characters, modernized and enlarged, on vintage-style packaging. It's Princess Leia from Star Wars: Episode IV - A New Hope. Featuring 20 points of articulation and bigger, better accessories. Star Wars The Black Series 40th Anniversary Vintage 6-Inch Action Figures bring back the legends that started it all. The original 12 Kenner characters are back, but the legendary collectible action figure line has been modernized and enlarged on vintage-style action figure packaging with incredible sculpts and accessories from Hasbro and Gentle Giant Studios! The Class of 1978 never looked better. You'll find the greatest characters from the original Star Wars action figure line updated with over 20 points of articulation on a vintage-style cardback! Ages 4 and up. 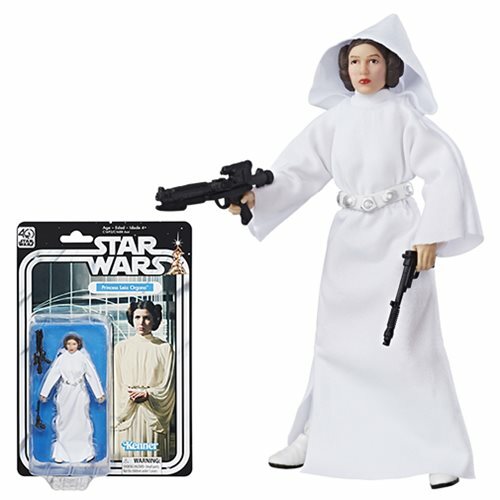 This Star Wars Black Series 40th Anniversary Princess Leia Organa 6-Inch Action Figure includes her classic blaster as well as a cool Stormtrooper blaster.